Ancient Egyptians did a lot of little things as they built the great pyramids. They’re not as dramatic, but they have had as much influence on Western and Islamic cultures. As the pyramids were built, scribes were outlining the importance of proportion. Artisans used a grid for the standing human body that had 18 squares. But their renditions of people were anything but cold. Though the sphinx in the above picture is in the guise of the 18th Dynasty queen, Hatshepsut, it follows conventions set during the 4th Dynasty, around 2500 BCE. The face is rounded in a way that makes it both strong and gentle. 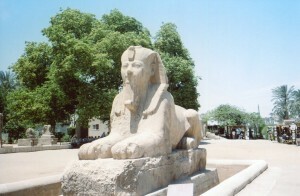 This became an ideal for representing the Pharaoh in the Old Kingdom and New Kingdom. The Pharaoh embodies Maat, the sacred order that the universe and the state depend on. But this order is portrayed as beautiful and soft. 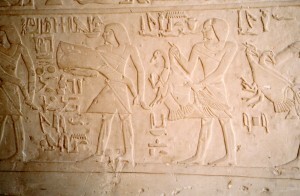 Above, we see these softened forms in the birds’ bodies that are carried for a departed elite at Saqqara during the Old Kingdom. You can see equal elegance in the people’s gaits, and in the symmetry of their spacing. The procession carries food for the soul in the Afterlife, but it’s conducted with refinement that transcends the narrative. Everything has a symmetry that embodies Maat. The false door at the center of tombs also treated symmetry in a spiritual way. A stone rendition of a door was the tomb’s focal point. 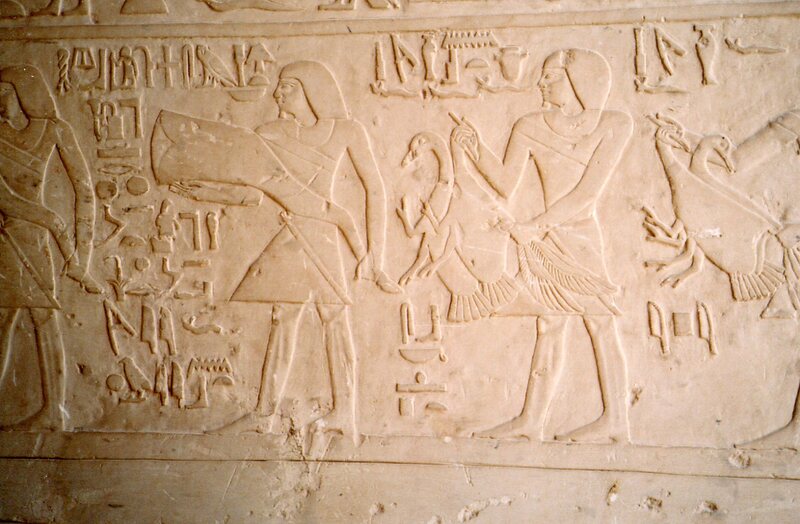 It carried an offering table scene and the name and titles of the tomb-owner. Owners also used them for brief statements about their moral worthiness. One man wrote, “I spoke truly, I did right. I spoke fairly, I repeated fairly.” The words have the symmetry of carvings. The false door was thus the ultimate statement of a person hoping to transform his soul into eternity. Symmetry worked on many levels here–in the pictures, in the words, and as the place of meeting between the living world and the Afterlife. The canons of beauty that were perfected as the great pyramids were built ordered society, and they helped the soul achieve its ultimate dream. These soft and balanced aesthetics ordered ancient Egyptian society in many ways besides the perfectly proportioned pyramids. People internalized them in their ideas of how to behave, and in their views of how to achieve eternal life. We’ll see one more key aspect of ancient Egyptian mores in the final post. You can also go to Part One of this series.